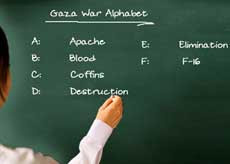 GAZA CITY — "A for Apache, B for Blood," little Shaimaa wrote in her colorful school notebook. Amal Yunis, a teacher, did not see Shaimaa's alphabet collection, but says many in her kindergarten class are already using the very same words. She recalls when she entered her class holding pictures of apples, flowers and rabbits, hoping that the bright colorful photos will cheer the kids. "Kids, who knows a word that starts with 'F'?" Yunis asked. "I know, Miss," young Amgad immediately answered. "It's 'F-16'." The teacher tried in vain to convince him that the right answer was "Flower". To her surprise, the other options put forward by the other kids were: Fear, Flee, Fire. "He instantly starts to cry 'mom, bombs'." A group of NGO's warned in March that "a generation of Palestinian children faces the danger of being psychologically damaged beyond repair." A study of Canada's Queen's University has concluded that the pattern of violence against Palestinian children is causing them serious psychological effects. "The children's new vocabulary mirrors the horrors they endured for weeks," Fadl Abu Hayen, director of the Center for Social Rehabilitation and Crisis Management, told IOL.